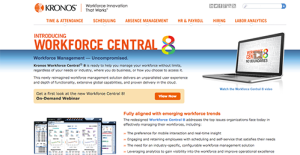 What is Kronos Workforce Central? Kronos Workforce Central 8 is a tool that helps companies in all industries manage their workforce. This newly reimagined workforce management solution offers top rate user experience, functionality, global capabilities, and cloud delivery. It is aligned with emerging workforce trends. With Workforce Central, Kronos offers a single central system of record that automates, optimizes, and simplifies the management of all aspects of the employee lifecycle. From hire to retire and all stages in between, you can use Workforce Central to manage your employees. Workforce Central is a completely automated solution with configurable integrated components which means fewer errors, seamless implementations, and an easily maintainable solution. The platform offers self-service applications that provide high-quality information. Managers and employees can get flexible, anytime access to personalized data from any device. The easy-to-use reporting and analytics offers managers and executives instant access and visibility to standardized and accurate data, alerts and dashboards, and analysis and trends of daily activities. Workforce Central offers a sleek, modern, and intuitive user interface, in-depth functionality, and out-of-the-box simplicity. If you are considering Kronos Workforce Central it may also be a good idea to examine other subcategories of Best Applicant Tracking Software listed in our database of SaaS software reviews. Enterprises have diverse needs and requirements and no software application can be ideal in such a scenario. It is pointless to try to find a perfect off-the-shelf software app that meets all your business wants. The smart thing to do would be to modify the solution for your special needs, staff member skill levels, budget, and other factors. For these reasons, do not hasten and pay for well-publicized leading systems. Though these may be widely used, they may not be the best fit for your particular wants. Do your homework, investigate each short-listed application in detail, read a few Kronos Workforce Central reviews, call the seller for explanations, and finally settle for the application that presents what you want. How Much Does Kronos Workforce Central Cost? We realize that when you make a decision to buy HR Software it’s important not only to see how experts evaluate it in their reviews, but also to find out if the real people and companies that buy it are actually satisfied with the product. That’s why we’ve created our behavior-based Customer Satisfaction Algorithm™ that gathers customer reviews, comments and Kronos Workforce Central reviews across a wide range of social media sites. The data is then presented in an easy to digest form showing how many people had positive and negative experience with Kronos Workforce Central. With that information at hand you should be equipped to make an informed buying decision that you won’t regret. What are Kronos Workforce Central pricing details? What integrations are available for Kronos Workforce Central? If you need more information about Kronos Workforce Central or you simply have a question let us know what you need and we’ll forward your request directly to the vendor.